The Roots of "Art Music"
Unknown Fela: I Go Shout Plenty! I have been a fan of your website Likembe for a couple years since I came across some thing you posted about Kuku Sebsebe. I also wanted to introduce myself to you. My name is Danny Mekonnen. I am a Ph.D. candidate in ethnomusicology at Harvard. I work on Ethiopian music and will start my dissertation in about one year. I am also a bandleader and musician -- I play saxophone in my group Debo Band. The group is an 11-piece Ethiopian pop, together now for over three years. We've been given the incredible opportunity to bring Ethiopian music for the first time to East Africa’s largest music festival: “Sauti za Busara” on the island of Zanzibar, February 11th-16th, 2010. We will bring with us 4 Ethiopian musicians and dancers living in Addis Ababa. This is a major opportunity for us to reach a wider audience and make further connections and collaborations with music in Ethiopia and East Africa. Debo Band has launched an online fundraising campaign, and we have just 15 days left to raise more than $5,000 to pay for our upcoming African tour. We'd love you to watch our video and help spread the word. The success of this effort depends on this news reaching people far and wide. We've received a grant which only covers some of the cost, so we are now seeking (tax-deductible) donations to complete the budget and make this journey possible. Any amount makes a huge difference -- most donations are $25 or $50, which will add up quickly to help us to our goal. Many thanks in advance for your time reading this email and for the work you do through your blog Likembe. I hope than we can be in touch in the future, and that we can find a way to work on something together. All best wishes for the new year! Researching that last post has got me to pondering the ways in which the kora, the traditional 21-string harp-lute of West Africa, has been combined with more modern sounds. There are plenty of examples, from the musical fusions of Foday Musa Suso and Djeli Moussa Diawara to Toumani Diabate's collaborations with Taj Mahal and Björk, to, incredibly, Naughty By Nature's 1991 smash hit "O.P.P." 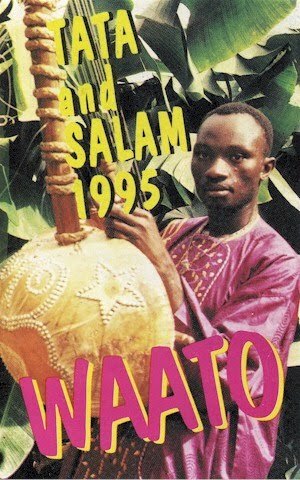 None of these attempts to update the classic sound, in my opinion, approach the pure polyphonic joy of Ebrima Tata Jobateh's cassette Waato, recorded with his group Salam (apparently members of his extended family) and released by Kerewan Sounds in Gambia in 1995. You can download Waato as a zipped file here. More new-fangled kora sounds to follow. The Casamance region of southern Senegal has been the scene of sporadic fighting over the years between the central government and the separatist Mouvement des Forces Démocratiques de Casamance (MFDC). The area was formerly a Portuguese possession and is culturally distinct from the rest of Senegal. The name "Casamance" is said to derive from the Portuguese word for "house" combined with the Mandinka word for "king." An alternative explanation attributes the name to an old kingdom in the region called Kassa. The music of Casamance also differs from the mainstream Senegalese sound, having more in common with the music of Guinea and Mali, with a distinctive Lusophone flavor. 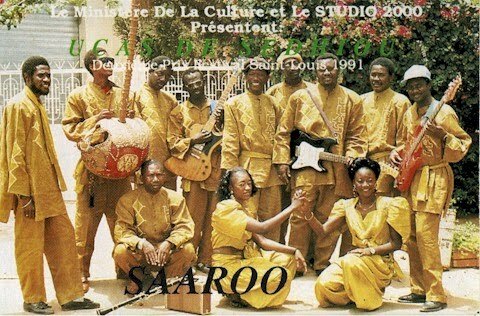 Orchestre Baobab, Toure Kunda and Xalam all have roots in the region, but the foremost musical group in the area has been the Sedhiou Band, variously known as UCAS de Sedhiou or the UCAS Jazz Band. 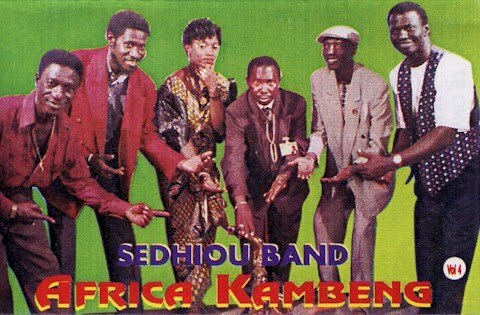 The Sedhiou Band was founded in 1959 as the musical group of the Union Cultural Association in the town of Sedhiou, and has had a varied lineup over the years. The most recent configuration features Ibrahima Sylla Dia on lead guitar, vocals by Abdoulaye Dandou Diedhiou, Seydou Ndao, Amadou Leye Sarr and Aminata Dieng Ndiaye, and a battery of percussionists and other musicians. The group came to the attention of most African music fans outside of Senegal when Africa Kambeng (Africassette AC9404) was released in 1998, a recording that is still in print and available from Amazon and Sterns. 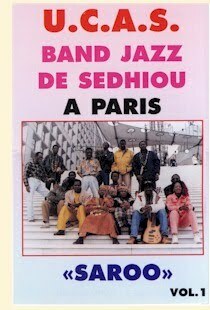 The Sedhiou Band have released numerous recordings over the years (a 1970s LP is available from Worldservice here). I possess four cassettes by the group released during the 1990s, from which I present selections here. It's a sort of "Sedhiou Band Best of the '90s," as it were. Download these tracks as a zipped file here. If you enjoy this music, go to this post about Ramiro Naka from Guinea-Bisaau, and see if you don't hear a connection. I didn't know what to expect when I posted a recording of Fela Sowande's African Suite a couple of weeks ago, but the reaction has been surprisingly positive, not only in comments and emails but in the the number of downloads. I say "surprisingly positive" because I didn't know what people would make of this effort to fuse African traditional music with European classical forms. Turns out that African "Art Music" isn't the obscure back ally that I thought it was. Not only is there a lot of it out there, it is the subject of a surprising amount of scholarship. Andreas Wetter directs us to two articles on his website Ntama, and the internet offers up considerable analysis for those who are interested. Reader/listener William Matczynski has passed on a couple of tunes that were direct influences on passages in African Suite. 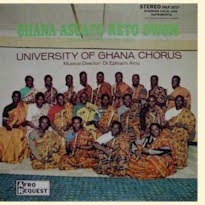 "Akuko Nu Bonto," a Fanti-language song by George Wiliams Aingo from Ghana bears a sharp resemblence to "Akinla" in the suite (and, I might add, to the classic highlife song "Saturday Night," which has been recorded by just about everybody). This version of the song was recorded in London in 1927 by Zonophone Records and distributed all across West Africa. 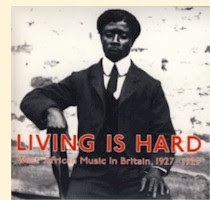 It is included on the fascinating release Living is Hard: West African Music in Britain 1927-29 (Honest Jon's Records HJRCD 33). We can't tell you anything about Mr. Aingo but the CD Roots of Highlife (Heritage Records, 1992), now long out of print, collects a number of his recordings. Ghanaian composer Ephraim Kwaku Amu was a trail-blazer in the field of transcription of traditional African songs. He was born in 1899 and began teaching in 1920, contemporaneously with his musical education under the Rev. Allotey-Pappoe. This is a joyful day. Why be sad, when all around is happy and merry? Work and merrymaking alternate each other to make life enjoyable. We pledge to engage in both, work and merrymaking, each in its appropriate time to make life happy and merry. Miles Cleret of Soundway Records asked my wife Priscilla to translate some Igbo-language songs for inclusion on the upcoming Volume 2 of the amazing Nigeria Special. Interestingly, in light of our subject matter, one of those songs, "Egwu Umuagboho" ("The Young Maidens' Dance") is by Joy Nwosu Lo-Bamijoko (above), one of the leading lights of Nigerian Art Music. Ms. Nwosu was born in 1940 and has lived in the United States since 1996. In 1961 she journeyed to Rome on an Eastern Nigerian Government scholarship with the ambition of becoming an opera singer. Here she studied in several conservatories for ten years. Returning to Nigeria in 1972, she became Producer of Musical Programs for the Nigerian Broadcasting Corporation and became a Musical Lecturer at the University of Lagos in 1975, holding a number of posts in that institution until 1992. "Egwu Umuagboho" is unavailable for download at this time. Many thanks again to William Matczynski and to Priscilla. The beaded artwork at the top of this post is by Nigerian artist Jumah Buraimoh. You can learn more about him here. Over the years there have been efforts to adapt African music to Western "classical" instrumentation and forms. One of the countries where this has been most successful is Nigeria, where this genre is called "Art Music." In his book The World of African Music (Pluto Press/Research Associates, 1992), Ronnie Graham briefly discusses Nigerian Art Music and regrets that it hasn't gotten more attention. Among the composers Graham cites are Lazarus Ekwueme, Samuel Akpabot and Josiah Ransome-Kuti, a pastor and choral music composer who was the grandfather of Fela Anikulapo Kuti. Fela Sowande, left, considered by many the father of Nigerian Art Music. 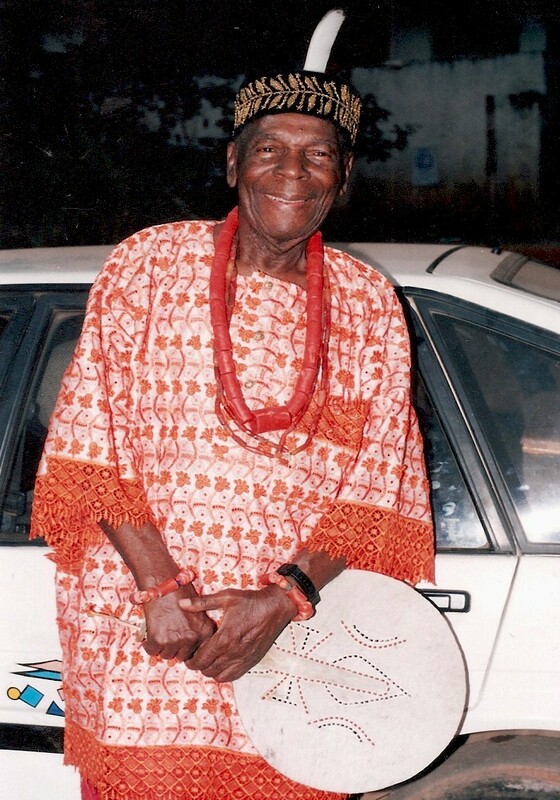 Olufela Sowande was born on May 29, 1905, in Abeokuta, a historically important city that was the capital of the Egba United Government, an independent entity which became part of the British Protectorate of Nigeria in 1914. Sowande was introduced by his father, an Anglican priest, to choral music and was an accomplished pianist by the time he graduated from Kings College in Lagos. Exposure to jazz broadcasts from abroad led him to found the Triumph Dance Club Orchestra in the early 1930s. During his studies in London to become a civil engineer, Sowande supported himself as a jazz musician, befriending a number of African American musicians in the process, notably Paul Robeson and Fats Waller. In 1940 he performed his own compositions on the BBC Africa Service and later served as Music Director of the Colonial Film Unit. 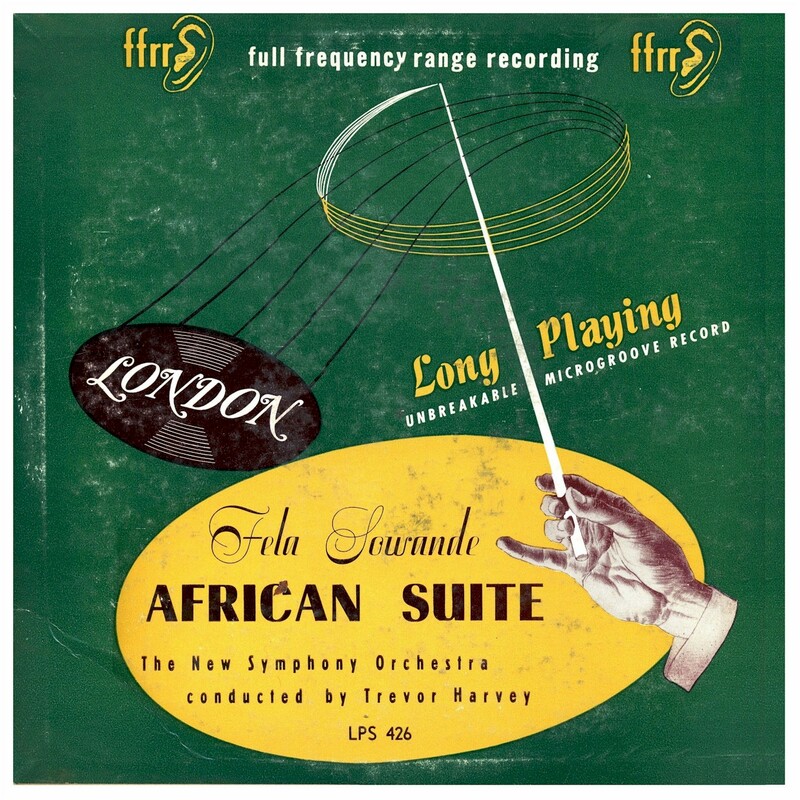 The African Suite, written in 1944, combines well-known West African musics with European forces and methods. 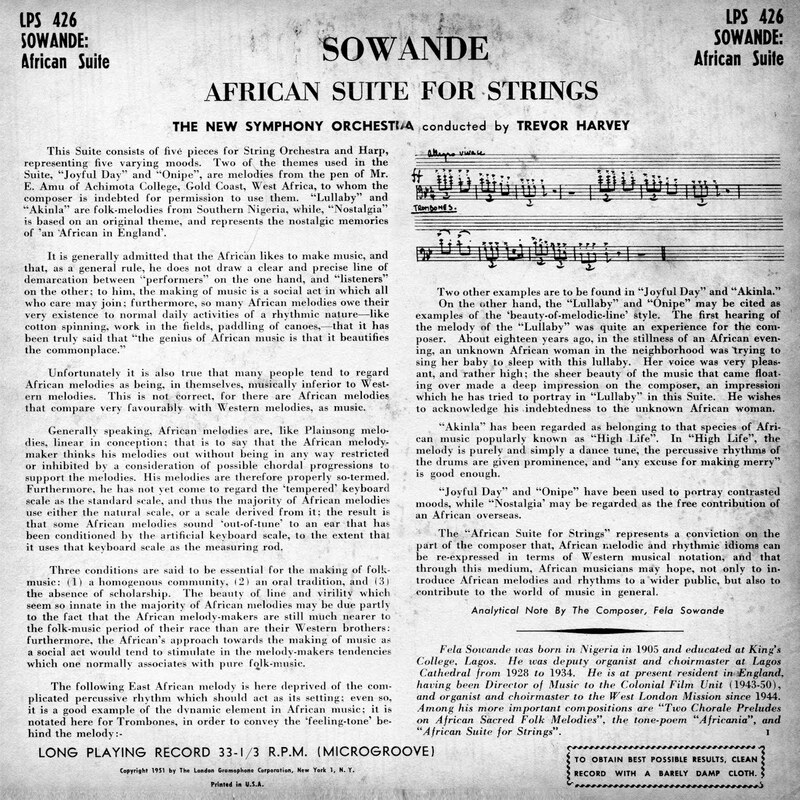 For the opening movement, "Joyful Day," Sowande uses a melody written by Ghanaian composer Ephrain Amu, as he does in the fourth movement, "Onipe." In "Nostalgia," Sowande composes a traditional slow movement to express his nostalgia for the homeland (in itself a rather European idea). At the centre of the work is a restive "Lullaby," based on a folk original. The finale of the Suite, "Akinla," traces a very singular musical history. It began as a popular Highlife tune - Highlife being a pungent, 20th-century style, combining colonial Western military and popular music with West African elements and a history of its own. Sowande then featured it as a cornerstone of his "argument" that West African music could be heard on European terms: the African Suite was originally broadcast by the BBC to the British colonies in Africa. Years later, in another colony far away, the sturdy Highlife dance tune became famous as the theme song of the long-running CBC Radio programme "Gilmour's Albums", a typically idiosyncratic choice of the host, Clyde Gilmour. He believed in the philosophy of cultural reciprocity and argued against what he called "apartheid in art." According to him: "We are not prepared to submit to the doctrine of apartheid in art by which a musician is expected to work only within the limits of his traditional forms of music." He therefore warned against: "uncontrolled nationalism in which case nationals of any one country may forget that they are all members of one human family with other nationals." 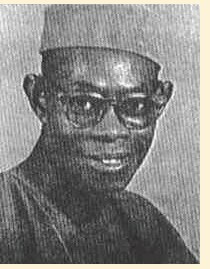 Following a long and fruitful career composing and teaching at Princeton, the University of Ibadan, Howard University and the University of Pittsburgh, Sowande died of a stroke in Ravenna, Ohio on March 13, 1987. I confess that I'm not in a position to evaluate African Suite as a classical music composition, although it's certainly pleasant enough. The liner notes by Sowande (below, click to enlarge) shed some light on the thinking and influences behind the piece. I would be interested to hear from readers and listeners who have more personal knowledge of the folk tunes that were incorporated into the composition. 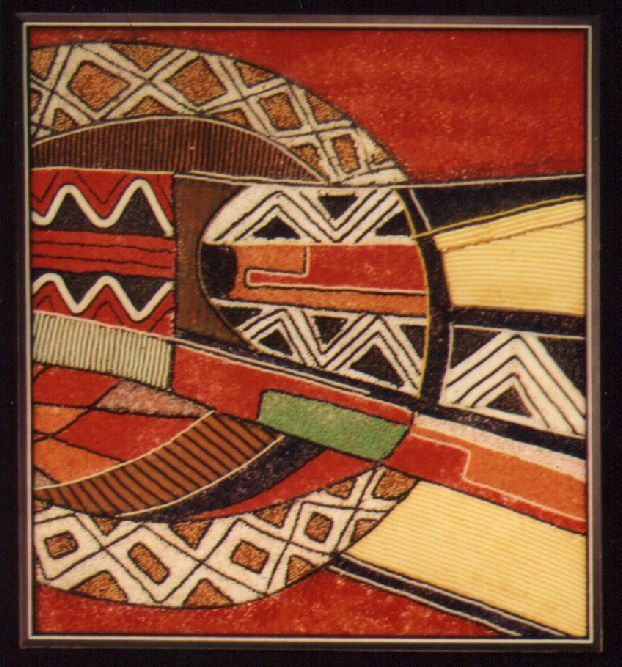 African Suite is an illustration of the many varied forms that "African music" takes. Enjoy! African Suite can be downloaded as a zipped file here. 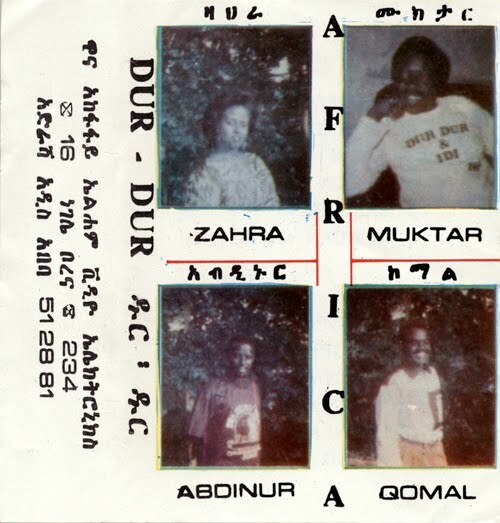 If you like the music of Somalia's Iftin and Dur Dur, featured some time ago in this space, let me direct your attention to Andreas Wetter's new blog Kezira, whose latest post features a whole cassette by Dur Dur, recorded some time in the early 1990s. As Andreas tells it, the developing civil war in Somalia forced the group across the border to Ethiopia, where Africa was recorded and released by Elham Video Electronics in the provincial town of Negele. Vocalist Sahra Dawo, who has drawn raves hereabouts, features on several tracks. While I'm at it, let me comment on the current state of the African music blogosphere, whose quality has advanced dramatically in the last couple of years. Notable in this regard are three sites - African Music Treasures, Electric Jive and World Service, whose proprietors regularly grace us with their knowledge and insight. This is not to slight outstanding work also by Oro, Global Groove and Freedom Blues, whose copious postings of hard-to-find recordings have forced me to buy a new hard drive. I'm overwhelmed really - I just haven't had time to listen to all the great music that's come my way, thanks to these busy beavers. In 1971, after several years of musical experimentation following the breakup of the super-group Cream, British drummer Ginger Baker made his way to Lagos, Nigeria, where he helped set up EMI's new 16-track recording studio. It was here that Baker re-united with his friend Fela Anikulapo Kuti (then known as Fela Ransome-Kuti) and recorded Stratavarious (Atco SD 7013), one of the first collaborations between an African musician and a Western rock star. To the best of my knowledge, Stratavarious has been out of print ever since it was released in 1972 and consigned to oblivion shortly thereafter, although one or two cuts from it may have been included in compilations. 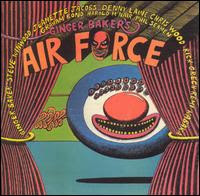 It is very much Ginger Baker's "thing," although Fela plays an important role on several tracks. Also present is Fela's American girlfriend Sandra Izidore (credited as "Sandra Danielle"). Strativarious is a fascinating look at a magic time when rock, jazz and Afrobeat were taking their first tentative steps toward each other, and a harbinger of fusions to come. It certainly deserves more attention than it's gotten. Like the recordings featured in the last two posts, Stratavarious was originally posted on Uchenna Ikonne's With Comb & Razor blog. Stratavarious can be downloaded as a zipped file here. This series of posts was occasioned by the recent announcement that Knitting Factory Records plans to reissue the "complete" Fela discography, although as I pointed out here, there are a few titles missing. In addition to Stratavarious, Perambulator and I Go Shout Plenty!!! the 1985 Bill Laswell "remix" version of Army Arrangement (Celluloid CELL 6109) is long out of print with no plans for reissue (it was released while Fela was in prison and he is said to have hated it). Toshiya Endo's Fela discography lists a number of other tunes that have never been released in any form. Notably, Knitting Factory plans to release the "entire" catalog of recordings Fela made with the Koola Lobitos in the 1960s. This is good news indeed. 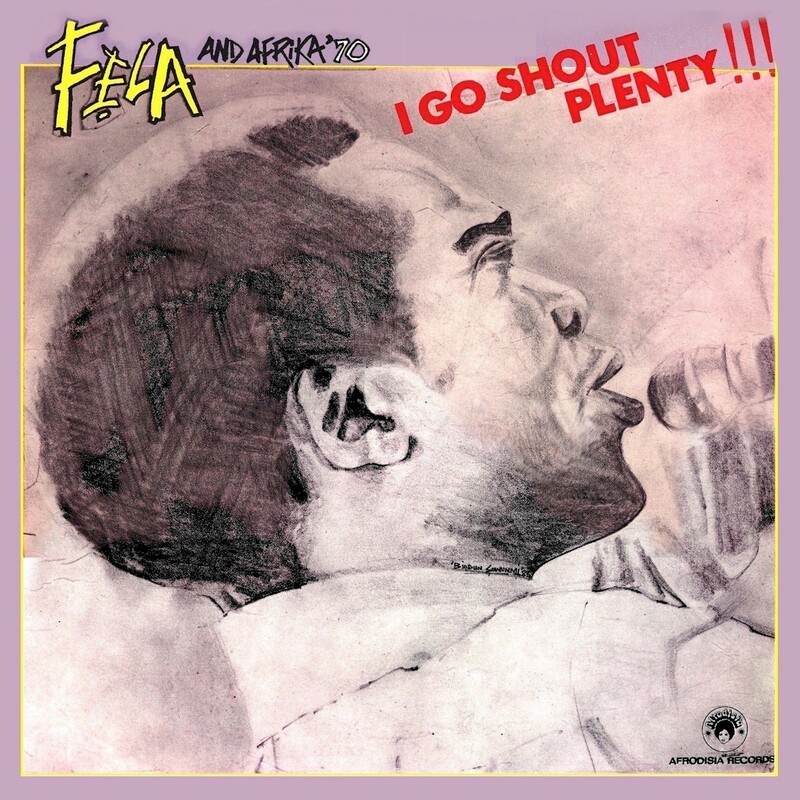 Here's another Fela rarity for your musical enjoyment: The Afrodisia disc I Go Shout Plenty!! (DWAPS 2251), released in 1986 but apparently recorded earlier. Like Perambulator, featured in my last post, I made this available to Uchenna Ikonne's With Comb and Razor blog a couple of years ago, and as it is no longer online, I'm making it available again. According to Toshiya Endo, Side A ("I Go Shout Plenty") was recorded in 1977 as DWAPS 2038 but never released (the B Side was to be "Frustration of my Lady" or "Frustration," which later became the B Side of Perambulator). Side B, "Why Black Man Dey Suffer," was also recorded in 1977 as the A Side of DWAPS 2036 (Side B was to be a song titled "Male," which I don't believe has ever been made public), but also not released. 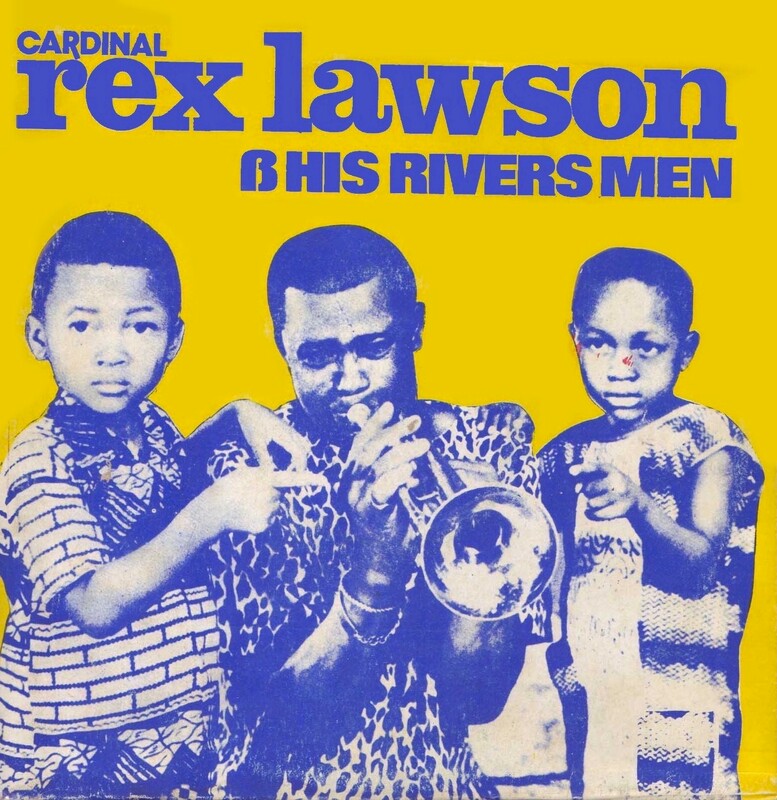 This is a different version of the tune of the same name that was released as African Songs AS001 (and recently reissued on CD) in 1971 (that version features Ginger Baker). No personnel listed, but I wouldn't be surprised if Lester Bowie played on these tunes also. In fact, I wouldn't be surprised if these tracks were recorded in the same set of sessions as "Perambulator" and "Frustration." These aren't really primo Fela tunes, and he is said not to have approved their release. I suspect that in 1986, however, shortly after the Black President was let out of prison, Afrodisia Records thought it could make a few Naira off of the attendant publicity and put them out. You can download I Go Shout Plenty!!! as a zipped file here. In my next post I'll be discussing Ginger Baker's LP Stratavarious, recorded with Fela in the early '70s. By way of Undercover Black Man I learn that Knitting Factory Records intends to remaster and reissue the "entire catalog" of Nigeria's late Afrobeat King Fela Anikulapo-Kuti in the next 18 months. I'm wondering what the difference is between this project and the extensive Fela reissue that saw the light of day about 10 years ago. Not that I'm complaining, of course, but I can think of several Fela pressings that are not among the "entire catalog" of 45 recordings listed for reissue on the Knitting Factory website. A few years ago, before Likembe got started, I made these available to Uchenna Ikonne to post on his With Comb and Razor blog, and as these are no longer online, it seemed like a good idea to put them out there again. 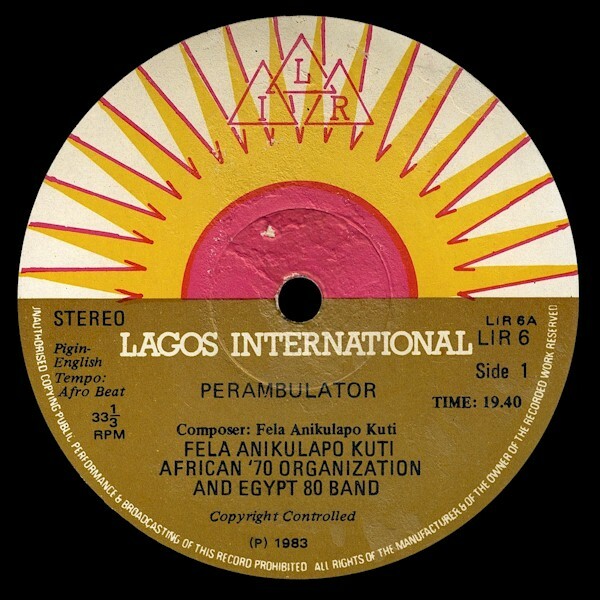 Perambulator (Lagos International Records LIR 6) was released in 1983, following a rather fallow period in Fela's career, and just before the jailing on trumped-up charges that would bring him back to the world's attention. "Perambulator," the song, was apparently recorded a number of years earlier. Toshiya Endo writes in his Fela discography that it was the B side of the French issue of Shuffering and Shmiling (Barclay 829 710-1) in 1978 while "Frustration" was recorded as "Frustration of My Lady" in 1977 as the B side of an Afrodisia LP that was never released. If you look closely at the credits on the back of Perambulator you'll see Lester Bowie credited as a "guest artist" (I think that's his trumpet solo about 6 minutes into "Frustration"). Bowie lived with Fela in Lagos for three months in 1977. A co-founder of the Art Ensemble of Chicago, he was also married for a time to Fontella Bass, who did the awesome 1965 R&B hit "Rescue Me." 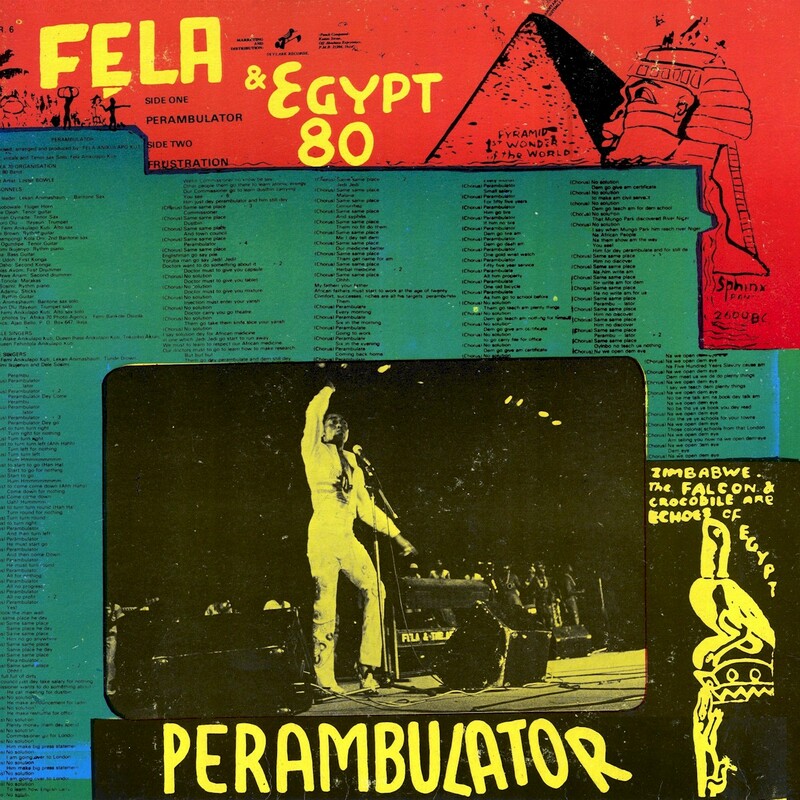 So contrary to the record cover and label, I don't think Perambulator is a "true" Egypt '80 record, as it was recorded several years earlier, when Fela's band was still called Afrika '70. 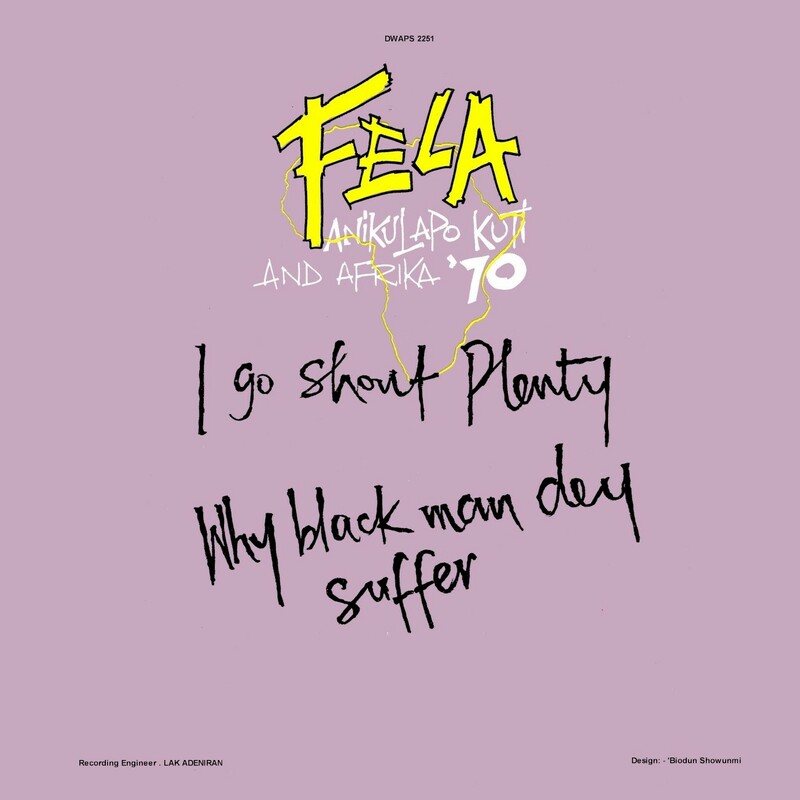 The record was not included in the "official" Fela CD reissue of the late '90s, although it did come out combined with Original Sufferhead (Lagos International Records 2, 1981) on a CD in Japan in 1998, a pressing that is no longer available. 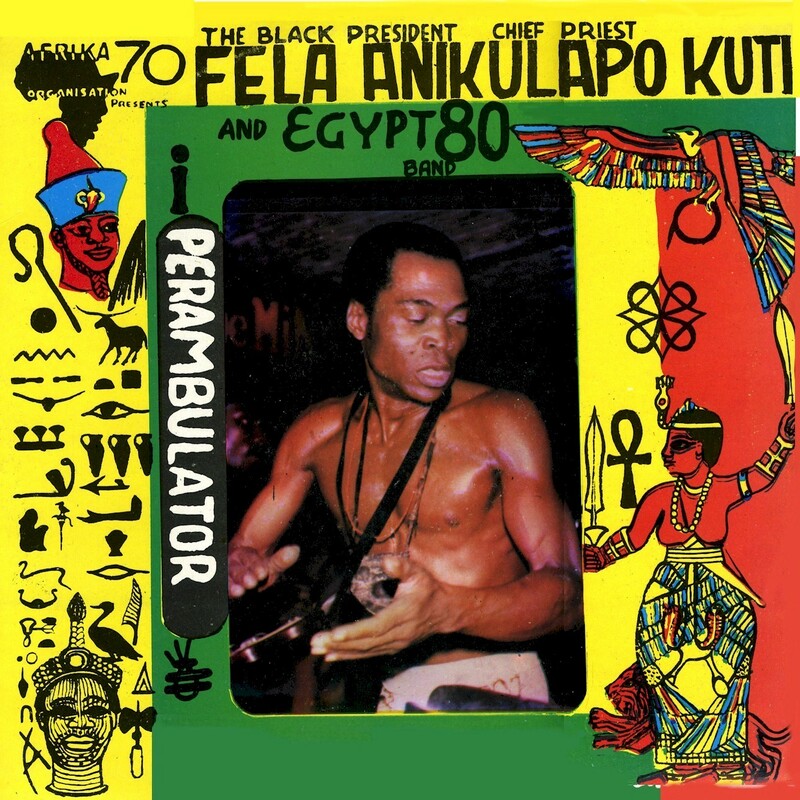 As to why Perambulator is not considered part of Fela's "official" canon, I suspect it was an unauthorized release. While it may be sub rosa it is certainly not sub-standard. "Frustration" in particular is a killer track. Enjoy! You can download Perambulator as a zipped file here. In my next two posts I'll discuss two more "unknown" Fela releases. 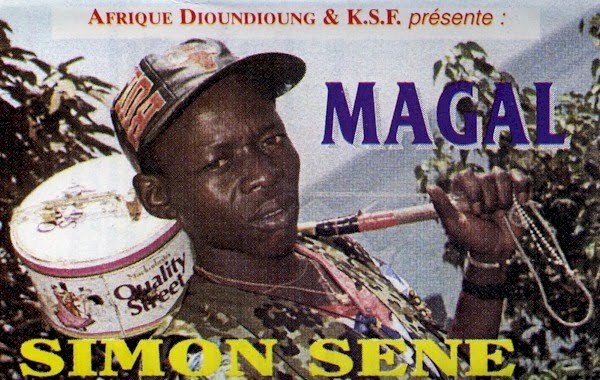 For all I know, recordings like Simon Sene's Magal (Afrique Dioundioung/KSF) could be as common as dirt in Senegal, so the title of this post may not be completely accurate. Still, the first time it came my way ten years ago, I knew that something set it apart from the general Wolof/Peul axis of modern Senegalese music. 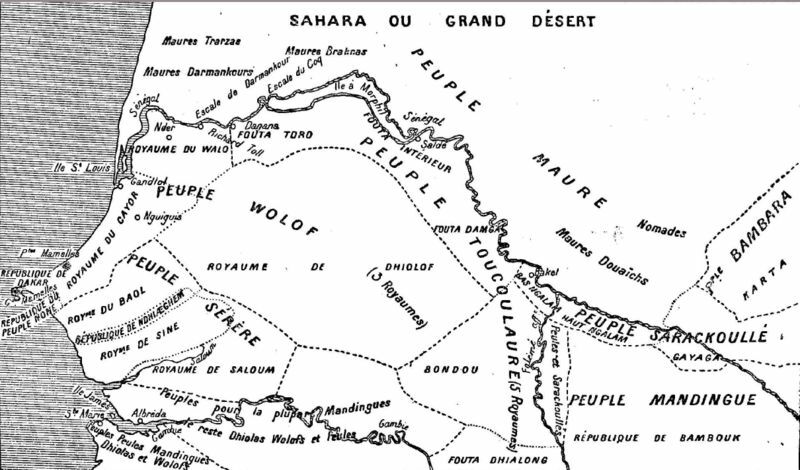 Now, from his My Space Profile, I learn that Mr. Sene is a Serer, the third-largest ethnicity in Senegal (see map below), a people that still retain animistic beliefs, although some members in recent years have converted to Islam or Christianity. As a singer of traditional music at weddings and christenings, he was discovered by Moussa Bopp of Radio Kaolack and encouraged to record. At first his family resisted, objecting that the songs were meant only for the griot caste, but he recorded his first hit, "Ndakaru," in 1993. His first cassette, Magal, with its sparse yet striking arrangements for keyboards and percussion, was released in 1997. With two further releases, Jamm Cassamance in 2001 and Yaye in 2006, Simon Sene has clearly taken his place in the pantheon of modern masters of Senegal music. Enjoy! You can also download this album as a zipped file here. In the future I will be offering this option for the convenience of Likembe reader/listeners, and I will also try to make it available in older posts as well. As the zipped files use "free" file-hosting services (as opposed to the individual tracks, which I pay to have hosted) I can't assure that they will always be available. Let me know how it works out. How to explain the dire state of the Nigerian music scene? Judging by what's being spun at parties in Milwaukee these days, it's beset by a plague of cheapo synthesizers and ticky-tacky drum machines, and the less said about the derivative sludge known as "Naija Hip-Hop" the better! The trend toward artifice and away from artistry is well exemplified by two Igbo musicians, Sunny Bobo and Eke Chima, whose recordings - copied, pirated and distributed from hand to hand - have been ever-present in the Igbo diaspora the last few years. 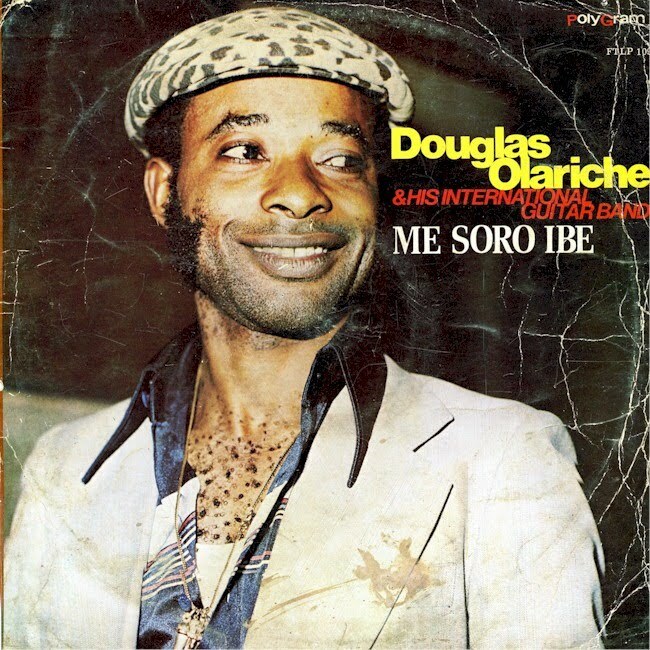 Both singers are said to be masters of the Owerri dialect, which may well be, but judging by their recordings, Old Skool, Obareze, and the many sequels, one can't help but feel sadness at the decline of that city's music scene since the glory days of the Oriental Brothers and their colleagues. I suppose economics are behind the sparse production values of these releases, but it's a regrettable situation still. 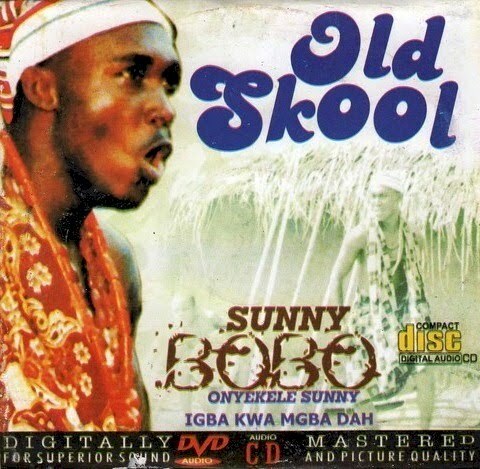 Sunny Bobo burst upon the scene a few years ago with Old Skool, and the sequels have followed fast and furious. The first volume of Old Skool reworks a number of classic songs from the Golden Age of Nigerian highlife. In typical Igbo fashion, Bobo sings that a meeting of the minds works best with one's own siblings. He describes a problem he is having with one of his kindred. He goes to the market, or public square ("nkworji") to settle the problem. In "Willie Willie," a rework of the Peacocks' "Mary Meriamam," he sings about a beautiful girl named Mary, with whom he is quite infatuated. The main theme of the song is to not lose your head: "Elewe ukwu egbuo ewu - look at nyash kill a goat." In other words, don't be so crazy looking at your love's behind that you will do anything for her. Sunny recounts that he and Mary were wed, but that things haven't really worked out. He asks his brothers, "What am I going to do? Love has wounded me!" A remake of Rex Lawson's classic "Love Adure" keeps things moving. Bobo sings, "Owerri land, please forgive my sins, because love has destroyed me. I am mesmerized by Adure's beauty. O tukwusa m'ukwu odika pillow. O tukwasa m'ishi odika pillow. When Adure places her leg on me it is like a pillow. When Adure places her head on me it is like a pillow." He then calls to an old girlfriend whom he has rejected for Adure, "Rosanna, please forgive me." "Kinkana," another old song by the Peacocks, refers to native gin, which unlike palm wine, doesn't go bad: "Kinkana no dey sour." Here the singer is proclaiming that, unlike some flashier fellows with their money and fancy clothes, he is for real. 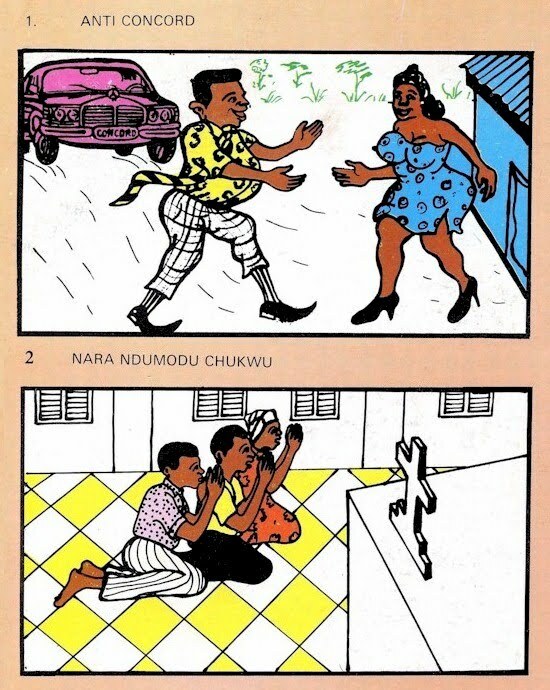 There is a reference to Osadebe's classic song "Baby Kwanangida": "Kwanangida no go marry." "Echendu" descibes a man who goes on a journey and doesn't come back: "Please come home. My heart is broken by your loss." 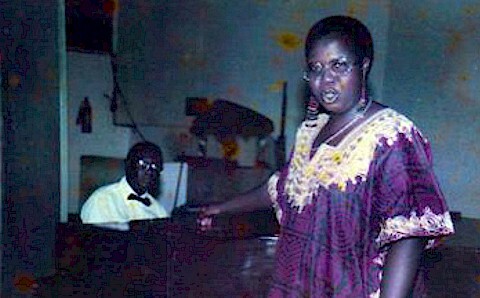 "Bottom Belle," the final song in the Old Skool medley, is a classic tune from the early days of Nigerian independence. 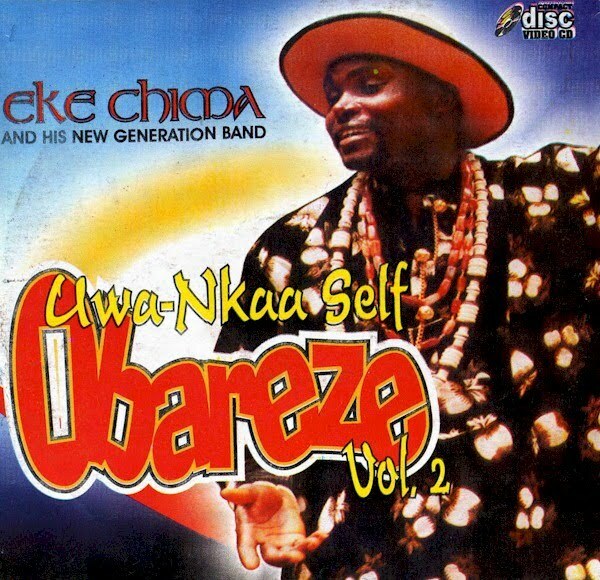 Eke Chima's offering here is similarly "Owerri-centric." 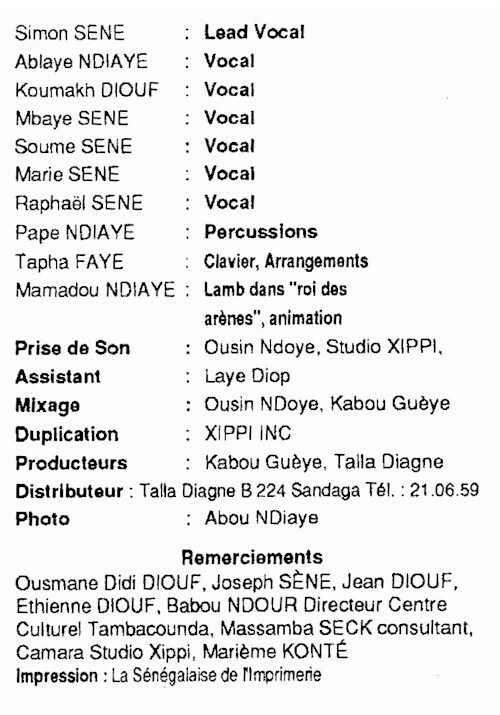 As this is from a copied CD-R I'm not sure of the exact title of the medley or which CD it is taken from, only that it is from one of his numerous Obareze recordings. Chima sings that people say they don't like Owerri, and in rebuttal offers the names of many prominent Owerri families and individuals: "Ole nde onwe Owerri? Who are Owerri people?," naming among others the Amanzes, the Njokus, Chief Onukaogu and Headmaster Boniface Oha. He then sings that someday everybody will account for their behavior in life: "Eshi ahu omenjo ga ahu njo ya, omenma ga ahu nma ya. The sinner will see his sins and the good person will see the good he has done. Ole onye ozuru oke? Who on this Earth will say that everything is complete for him?" He then calls out to a friend, "Ahu shiele m'anya - I have seen many troubles." Chima admonishes those who have taken a child's thing to raise their hand and give it back. In other words, don't mistreat another person, especially the helpless. He states once again that all will account some day for how they lived on Earth. Family relations are a prominent theme in Igbo music. Chima asks if a person doesn't have kin by the same mother (this is presumably referring to relations within a polygamous household) will he kill himself? Of course not. He states that since he has no other siblings by his mother he works very hard and hopes that God will be there for him: "Ebe mu onwehu onye inye aka, agam ime uwam nkpo ole." In the interests of fairness I should present evidence that things may not be so dire for Nigerian music after all: two artists, both scions of musical families, who would seem to refute my thesis that Igbo highlife is on its deathbed, if not already departed. Emperor Teddy Obinna is billed as "Junior Warrior," but he's actually the half-brother of Owerri's favorite son, the late Christogonous Ezebuiro Obinna, better known as Warrior. 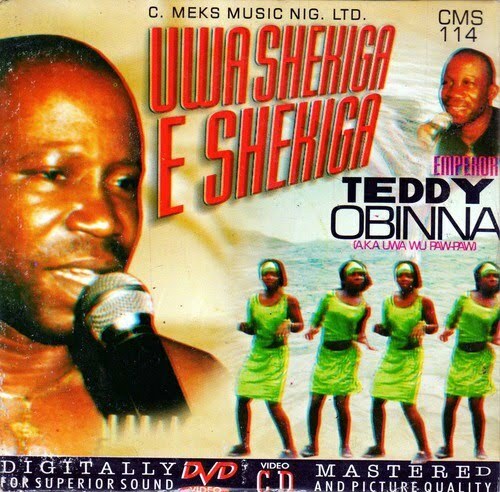 Ogidi's Amobi Richard Onyenze is the nephew of highlife legend Stehen Osita Osadebe, who passed away in 2007. The Emperor seems to spend a lot of time outside of Nigeria performing for the Igbo diaspora. He certainly has a feeling for their problems and concerns. In "Onye Nchem" he decries lazy Nigerians who take advantage of their hard-working relatives abroad. The song itself is about God's concern for the world. Obinna sings that without God's protection all of the guns and all of the armies in the world are useless. All of the people who bear grudges need God's blessing because he will judge them: "Let the Lord not protect an evil plotter." The chorus is "Make sure you are doing right." 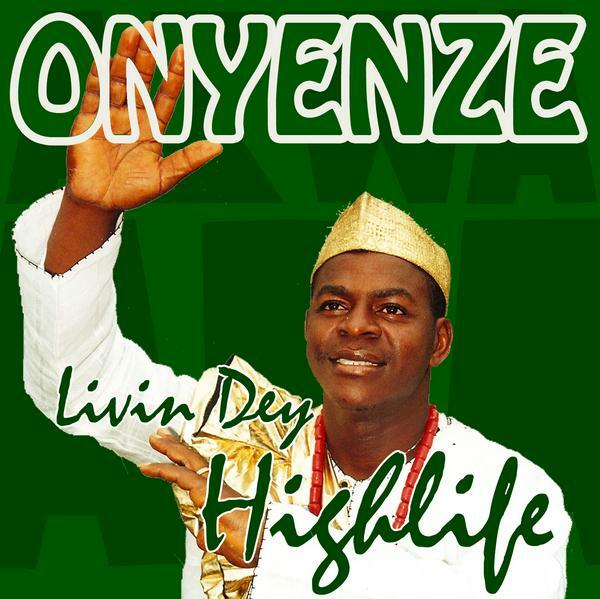 Judging by his eighth release Livin' Dey Highlife, available from Akwaaba Music, Amobi Onyenze is capably carrying on the Osadebe legacy, but one hopes that in the future he will strike out into fresh territory rather than continue to till the old man's field. In "Akachukwu di Ya" ("God's Hand"), Oyenze sings, "In everything we do in life we must seek God's hand to make it success. With God's hand our success is guaranteed. Whoever God's hand beholds shall never fall nor fail. God's hand is in my life, in my family. That's why I'm a success." Thanks once again to my wife Priscilla Nwakaego for interpreting these lyrics. The translation of "Akachukwu di Ya" was provided by Akwaaba Music. 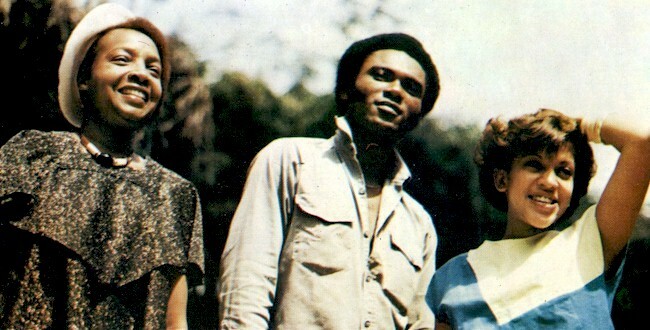 Sad as it is for me to report, I think the Igbo highlife sound, at least as we have known it, is dead and buried, the great stylists - Osadebe, Warrior and Oliver de Coque - having passed on in the last few years. In their places have emerged a new crew - Eke Chima, Sunny Bobo and the like - who have numerous fans but offer a synthesizer-and-drum-machine-based style that's just a pale imitation of the classic sound, at least in my humble opinion. In a future post I'll be discussing some of those new guys, but here I want to talk about some of the lesser-known musicians of the '70s and '80s, just a few of the journeymen who made the Igbo highlife scene of the time so vital and productive. In a way they're equivalent to the "garage bands" of the 1960s in the US, who toiled away in obscurity in hopes of someday scoring a regional hit. 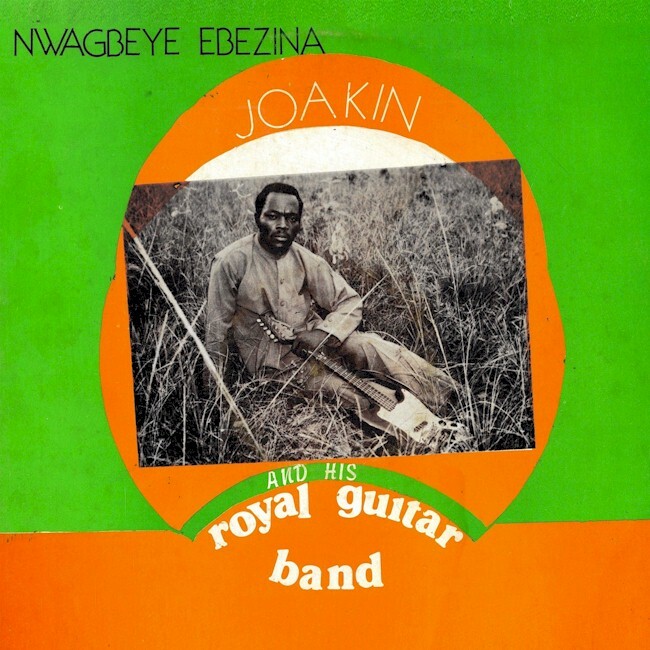 In the Nigerian case, some of these musicians put out numerous recordings and were quite popular. They just weren't in the top tier of the Igbo music scene. Finally we listen to Elvis Nzebude of Amagu, Anambra State. In "Ije Awele" ("Good Journey"), from the album of the same name (Rogers All Stars RASLPS 124, 1992), Elvis sings, "Ganiru, ganiru ("go forward"), we go where there is love, we go where there is peace, we go where there is respect. Because where there is respect there is peace. Let no one wish others death. Let everyone live." Many thanks to my wife Priscilla for her interpretation of these lyrics. As you may know, I've periodically been posting classic and hard-to-find music from Ethiopia here. 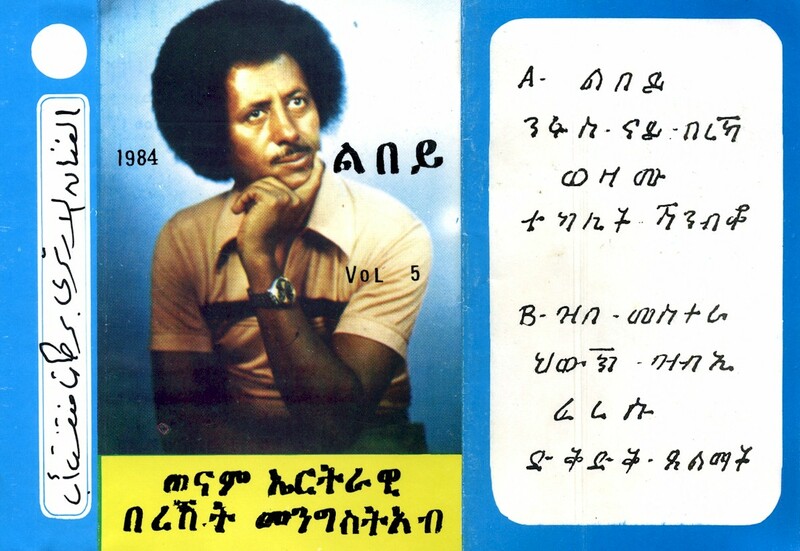 For some time, I've wanted to make available Lebäy (Toteel Music), a 1984 cassette by Eritrean musical legend Bereket Mengisteab (and yes, Eritrea is now an independent country, but in 1984 it was part of Ethiopia, so technically it qualifies). This is the only recording by Bereket that I possess, and I've long wondered about this enigmatic singer. Once again, I've been scooped by one of my fellow bloggers, as Matthew Lavoie of Voice of America's African Music Treasures devotes his latest post to this iconic musician. With his usual meticulous attention to detail, Matthew supplies a wealth of background information on his subject, having interviewed the great maestro personally in the VOA studios. There's nothing more I can add, but here's a small taste:. . . .Bereket Mengisteab was born in 1938 in the small village of Hazega, located about eighteen miles north of the Eritrean capital of Asmara, and this is where he spent the first two decades of his life farming. During these years in Hazega, Bereket taught himself the Krar (a five stringed lyre) and honed his musical skills, participating in all of the musical rituals that punctuate rural life. Then, after spending a few years in Asmara (which was part of Ethiopia at the time), Bereket moved to Addis Abeba in 1961. And it was in Addis that Bereket made his stage debut, as a member of the Haile Selassie Theater Orchestra; during the previous year he spent in Asmara he never performed outside of his circle of friends. 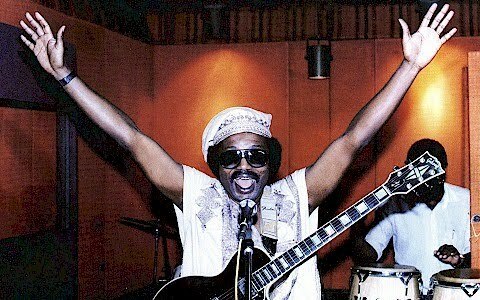 Bereket stayed with the Haile Selassie Theater Orchestra for a little over a decade, performing with the group throughout Ethiopia, in Kenya, Uganda, Tanzania, Senegal (at the 1966 Festival mondial des Arts Nègres), and in Mexico (at the 1968 Summer Olympics). During these years he also made his first recordings, nine singles for the Philips label (I don't know the exact dates and have not been able to find any of these singles). . .
. . . Tigrigna music, dominent in Tigray [province] and Eritrea, is quite distinct, both rhythmically and melodically, from "Ethiopian" music, although both share the so-called "pentatonic" (or five-note) scale. The instruments and the traditional musical practices are similar, while their names may vary. The massenqo (single-corded fiddle played with a bow) and especially the krar (a six-corded lyre) remain the most prevalent instruments. In Tigrigna country, the massenqo is more commonly termed tchèrewata and the same wandering minstrel that Ethiopians of the central highlands call azmari is better known here as a wata. Ethiopians call the lepers and beggars who sing at dawn lalibèla: here they are termed hamien or arho. Sometimes the krar is even called massenqo. In a notable development over the last few decades, many Eritrean musicians have encouraged the spread of the electric krar, used here widely (far more than in Ethiopia), and many excel at the instrument. . . Many many thanks to Andreas Wetter for transliterating and translating the song titles. Andreas has recently started his own weblog, Kezira, devoted to music from the Horn of Africa. Of course, it's highly recommended. As a follow-up to my earlier post From Congo to Kenya Pt. 1, here are some melodies courtesy of the Congolese diaspora in East Africa. Like that post, this one is focused on the early 1980s. In 1985, President Daniel Arap Moi ordered the expulsion of foreign workers, including musicians, from Kenya, and the Congolese/Zairean musical community there scattered to the four winds. 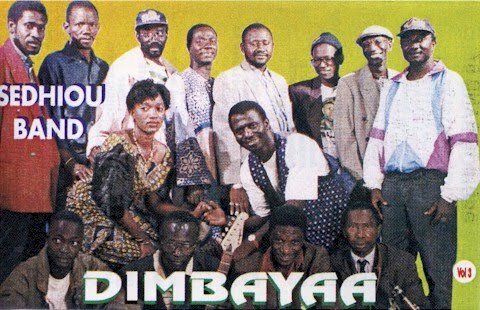 For more about these artists and many more I refer you once again to Alastair Johnston's essential article Congolese/Zaïrean Musicians in East Africa. I've been feeling bad about not being able to blog recently, but I see some of my fellow African music blogmeisters have also been slacking off this month! In my case the hiatus is due mainly to preparing for our first daughter's upcoming move to college - a big transition for all of us. To protect Aku's privacy I'm not going to say which school she's attending, but we're pretty happy with it, and of course we couldn't be prouder. So I hope to be back in action in a week or two. In the meantime may I draw your attention to two worthy new additions to the African music blog scene? ElectricJive specializes in South African jazz and jive, and I'm quite impressed with the first few entries, full-length LPs from Hugh Masekela, Barney Rachabane, Mahlathini and more, definitely worth your while. Then there's Afro-Synth, which for want of a better term features South African "bubblegum music," the synth-infused pop sounds that were all the rage back in the '80s and early '90s. For now the blog features mainly write-ups, but I understand it'll be adding more downloads as time goes by. I told Uchenna over at Comb and Razor this one was right up his ally! Not really my thing, but who knows? It might be yours. Take care, and happy listening! One of the fringe benefits of doing this blog is that I occasionally hear from the musicians I write about, and their relatives. Thursday I got an email from Anthony Obianwu, the son of "Uncle" Mike Obianwu, whom I wrote about briefly in this post, reporting his death on July 20th. He was 93 years old. Uncle Mike was not a well-known musician. 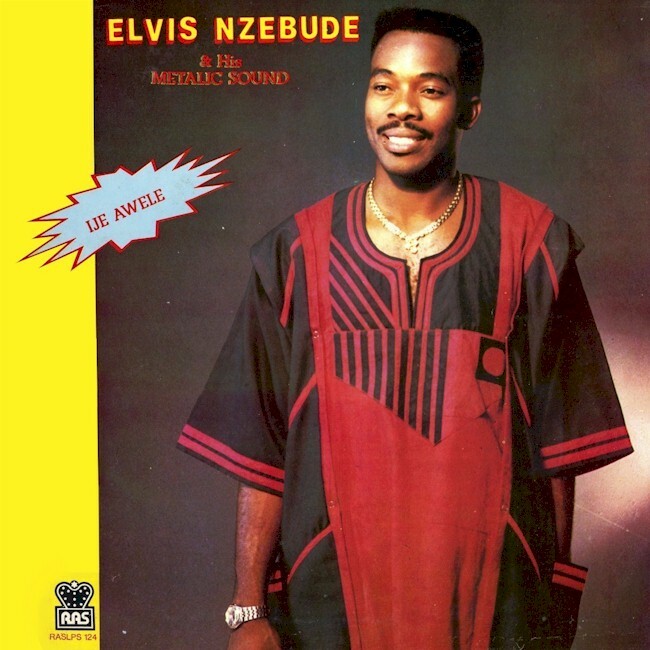 He is remembered mainly for his stellar piano work on Nelly Uchendu's famous LP Love Nwantinti (Homzy HCE 005, 1976), and the great irony of this achievement is that the album was originally credited to Obianwu himself, with Uchendu playing only a supporting role. 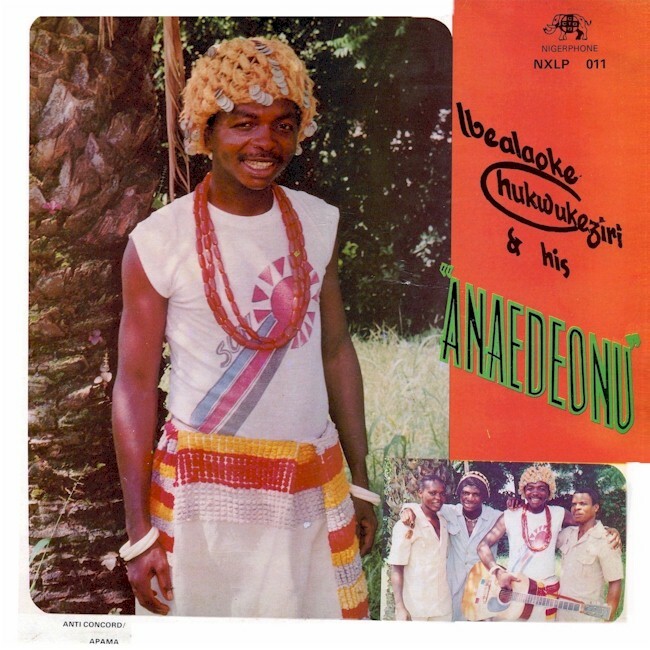 After Uchendu's acclaimed debut at FESTAC '77 in Lagos, the album was reissued with a new cover credited to "Nelly Uchendu and Mike Obianwu." Anthony tells me that his father released one other album in his own name, Crashes in Love, and I suspect he was present on other recordings as well. The other members of his band were Bassey Edim on bass and Willie Udor on drums, with Nelly Uchendu supplying vocals until her death in 2005. Ezennia Michael Davidson Obianwu, God saw you getting tired as your youthfulness turned gray. The days flew by as you celebrated your well lived 93years of aging memories. You were our ROCK and you will forever live in us, a befitting metaphor is your name OBIANWU. Your name will never die for we your children will carry on your legacy with every breath we draw. Your heart was so beautiful and pure, so meek and gentle, so loving and very forgiving. We became greedy, wishing you could hang around for another 93. We can now see that your every awakening and perseverance, is your way of hanging around to protect your loving family. The Almighty God knew this too, so HE wrapped his arms around you, and whispered, "COME TO ME." You went through a journey very few can only dream about, you married your beloved wife and our mother Victoria Obianwu on December 26, 1949, and you were both rewarded with beautiful children: Chinwe, (ADA) Obianwu, Okechukwu (Diokpa) Obianwu, Ebelechukwu Obianwu, Nnamdi Obianwu, Anthony Obianwu and the most supporting group of in-laws: Amaechi Mbanefo, Cecilia Obianwu and Chilo Obianwu. Our Daddy Ezennia was also blessed with many grand children: Uchenna Obianwu, Jane Mbanefo, Patrick Mbanefo, George Mbanefo, Ifeoma Mbanefo, Adaobi Obianwu, Osita Obianwu, Nnenna Obianwu, Ebelechukwu Obianwu Jr., Odiakosa Obianwu, and Adaeze Obianwu. Ezennia is also survived by a long chain of brothers and sisters, nieces and nephews, cousins and a sea of friends and well wishers. It goes without saying that you have led a fulfilled life. After serving proudly, fighting as a soldier in Burma during the 2nd World War with sustained injuries to show for it, you worked at the Federal Ministry of Information in Lagos and retired proudly as a senior civil service worker. Despite all this, your love for music kept shinning through. You played music at famous hotels in Lagos like Gondola and the Federal Palace, including the Presidential and Hotel Metropole in Enugu, Nigeria. You became very famous in music and touched many hearts. Your genius earned you the name "Uncle Mike Obianwu" and you recorded two albums including the award winning folk song "Love Nwantinti". You became one of the respected Agbalanze of Onitsha and was crowned with the title; EZENNIA and for this we salute you. Daddy, you were truly an accomplished man of God. He only takes the best. This is why He has called you home to give you rest. God's garden must be beautiful, and there must be a beautiful white Grand Piano, waiting for you in heaven, to strike beautiful melodies for God's listening pleasure and for the Angels to dance to. It was no surprise that on the day of your passing, you were jovial as usual and you told us how much you loved us. You then said "Tell 'V' I love her" (meaning Mom) and asked to let you rest. Your Doctor asked if you were ready to be discharged, your answer was "YES, I AM READY TO GO HOME" and home you went, drifting gently like the wind. When we saw you sleeping so peaceful and free from pain, we could not wish you back because the Lord needs you more now than we do. "For YOUR gift O'LORD, we will rejoice and be glad." Rest in perfect peace, Good Bye, All Our Love is with you. Once again our friend Rainer has come through with an exceedingly rare artifact from the golden age of Nigerian highlife music, in this case a 10" pressing of Love "M" Adure Special, from which I posted some tracks June 21. This was apparently the first pressing, released in 1972. Or maybe it wasn't the first pressing! Rainer writes, ". . . the label says AGR002 etc. But the matrix number says (P)1970 and gives a Philips label number 6386004 as a reference (the Dan Satch is from 1969/70 and has 6386008) Why did they write 1972 on the label? Was this supposed to be released on Philips first back in 1970 but saw the light of day in 72 on Akpola!? Or am I just thinking too much?" 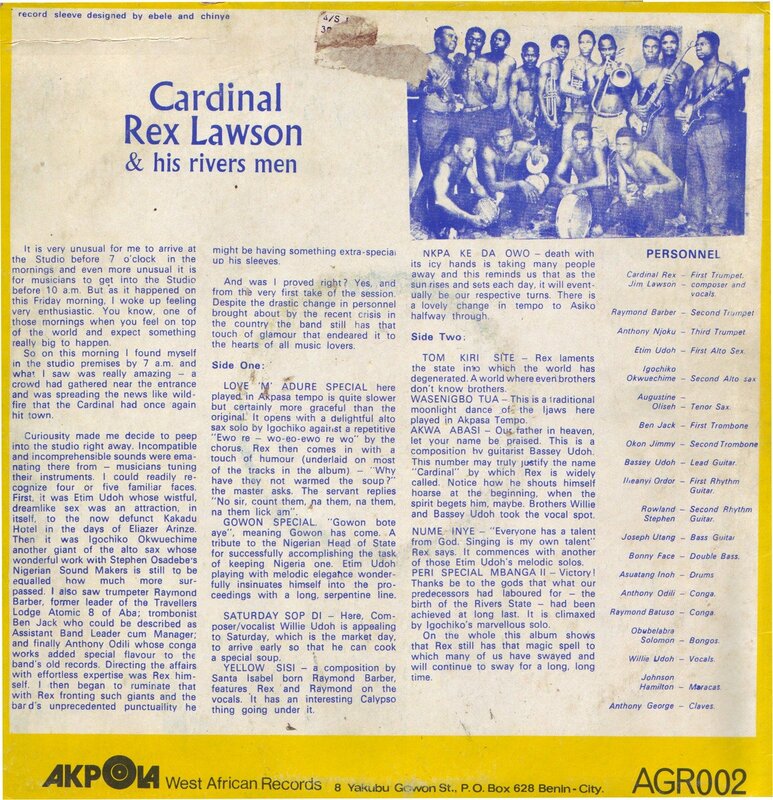 Apart from having a different cover and slightly different reference number (AGR 002 rather than AGB 002), this earlier iteration of Love "M" Adure Special, also on Akpola Records of Benin City, differs in several other respects from my copy. For one thing, it has 10 tracks instead of 12. Also, it includes the song "Gowon's Special," which was omitted from the later record, although it was listed on the sleeve. And for what it's worth, it's a much better pressing. I won't presume to understand Lawson's motivations for making "Gowon's Special" as well as the earlier "God Bless Colonel Ojukwu." One nice thing about the original 10" LP is that it includes a listing of the musicians and summaries of the lyrics. You can download the whole album as a zipped file here. In the comments there's been a side discussion on the question of whether records were actually pressed in Biafra during the war. I thought it was possible, even though all of the major pressing facilities were in the North and West before the war (Nigerphone may have had a plant in Onitsha). After thinking it over, and consulting the map below (click to enlarge) from John de St. Jorre's The Nigerian Civil War (Hodder & Stoughten, 1972), this seems most unlikely. 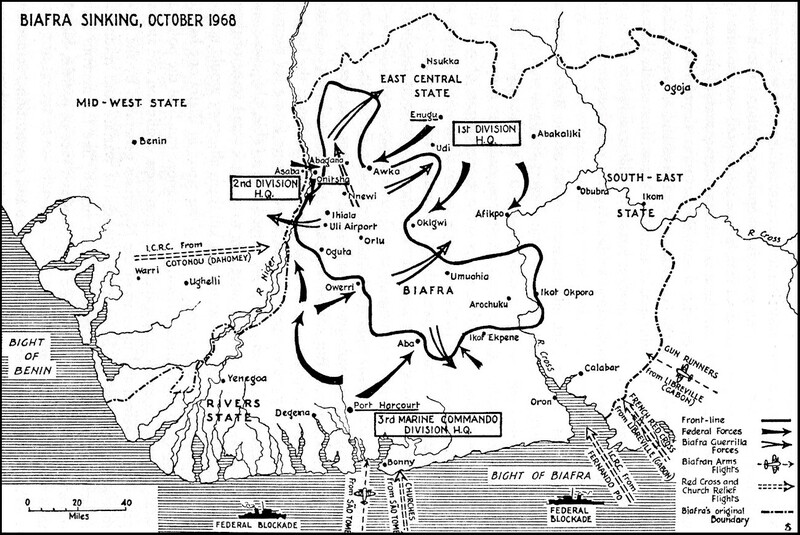 As the map shows, by October of 1968 the territory under Biafran government control had been reduced to about one sixth of what it was at Independence, and didn't include any of the major cities (Onitsha fell in March of 1968). Although the margins of the Biafran enclave changed slightly over the course of the conflict, this is where things stood until the last months before the war ended in January 1970. Therefore, any "Biafran records" would have to have been pressed outside of the country and smuggled in.